Vicky Troung’s Vietnamese Food as Art…. Last night I went to a Vietnamese restaurant and for the very first time in my three-quarters-of-a-century on this planet didn’t order Phở . Perhaps in an earlier lifetime I did, but it couldn’t possibly have been as beautiful as what I had last night. 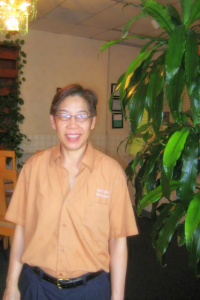 Vicky Troung, the owner and chef at Saigon Restaurant, creates art with a palette consisting of beautifully colored and heavenly tasting Vietnamese food decorated with sensational herbs and spices. I could almost hear celestial voices singing in the background.Vicky Troung opened this restaurant for almost 7 years ago, delivering crisp, fresh, subtle, amazingly delicious food. Egg Rolls. Perfectly formed and cooked to a gentle crispness, and stuffed with an unbelievably good mixture of ground pork and vegetables. Wrap these in lettuce leaves and adorn them with sprigs of cilantro and Thai-basil, spoon on some wonderful fish sauce, and you will have one of the finest egg rolls you are likely to get anywhere. I could easily make an entire meal of these treats, but then I would have missed what was to follow. 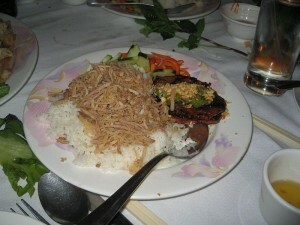 Broken Rice with Shredded Pork and Grilled Pork. 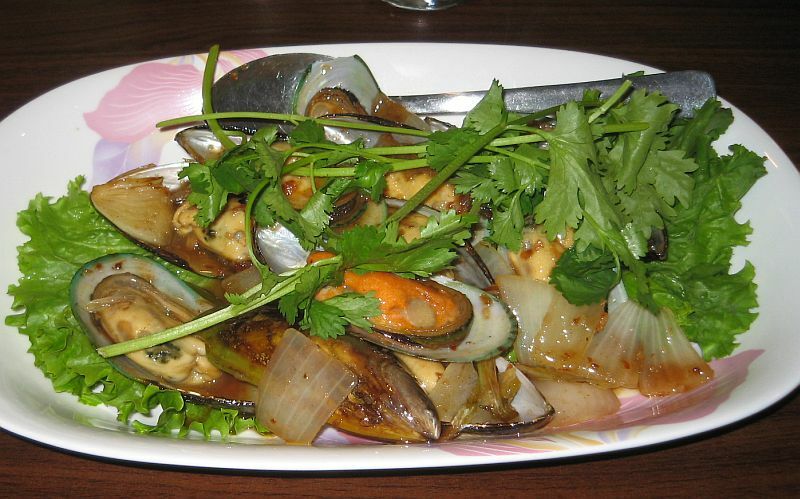 This dish is a sensuous combination of classic Vietnamese ingredients. 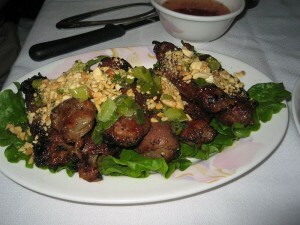 The grilled pork had that gently smoky taste that did not overpower this delicate dish. Vegetables with Chicken. This dish is much more interesting than it sounds. 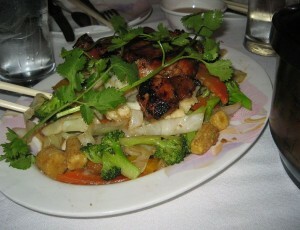 Beautiful and colorful vegetables with grilled strips of chicken breast, and again, the smoky grilling was outstanding. Grilled Onion Beef. For me, this was the real winner among the other outstanding dishes. Thin strips of beef wrapped around gently caramelized onions, sprinkled with peanuts, these morsels are among the tastiest entrees I have had anywhere. You must order this. Make a special trip, even if you’re not hungry. Superb meal. Superb service. There are 23 Vietnamese restaurants in Albuquerque. I have eaten in five. Saigon is the best by far, and I will return here to eat my way through the menu (which lists 145 items). Did I miss my Phở ? Yes. I will return to Saigon soon for a bowl of my beloved Phở Tai Nam. I will probably have a side order of Grilled Onion Beef. Saigon 2 has now opened in Rio Rancho. The menus are almost identical. Vicky was there the night we dropped in for our inutial West Side visit. But this time I had to try my favorite pho—pho tai nam, with the tai on a separate plate to be added at the table. This keeps it from being overcooked, and it still retains the texture and taste of very rare beef. 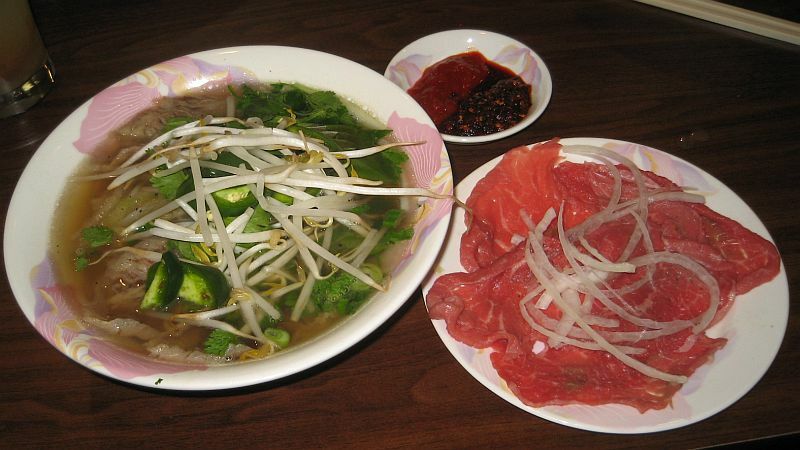 This pho is outstanding, and among the very best in the Duke City area. Fragrant, tasty, and beautifully spiced. We tried two appetizers: Pork and shrimp spring rolls (great) and stir-fried mussels with tamarind (#9 on the menu). These guys were plump, tender, and succulent, and the tamarind-based sauce is a welcome addition to the customary white wine and garlic steaming broth that is widespread here. Delicious, and a feast for the eyes as well as the palate. Wash the whole meal down with a glass of fresh lemonade, and ask for it to be not too sweet with some salt added. 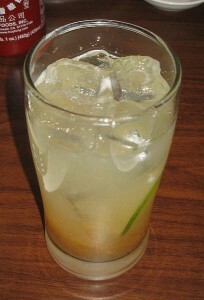 This salty lemonade has long been my favorite beverage in Vietnamese restaurants since I discovered it thirty years ago. The Vietnamese iced coffee is excellent here, too. 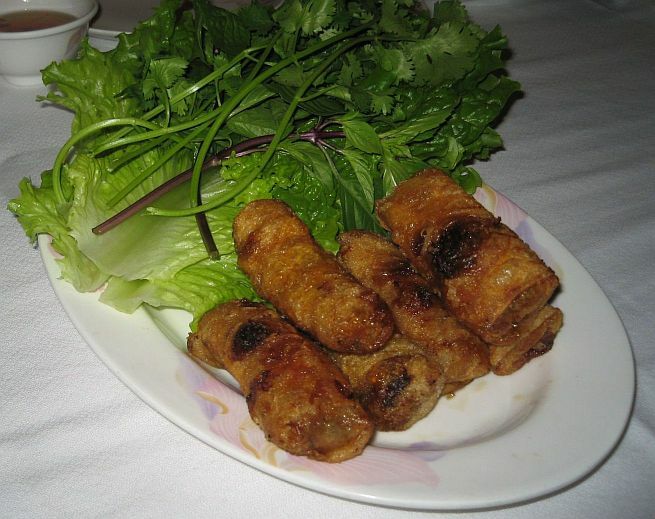 This entry was posted in Diet Friendly, Vietnamese. Bookmark the permalink. Great news, Larry. 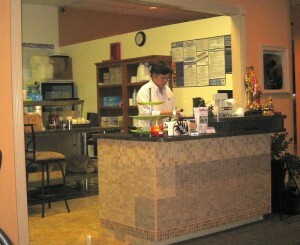 Vicki’s smiling face can now be seen at her new Rio Rancho restaurant Saigon 2 which opened on 11/11/11. 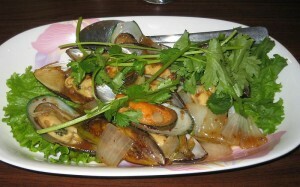 Saigon 2 has the same great menu as the San Mateo location save for not serving fish. At about 1,800 square feet, it’s somewhat smaller than the original Saigon, but it’s got the same warmth and great, great Vietnamese cuisine. I’ve been waiting for this opening. Thanks. I’ll try to convince Jane that we should go there tonight. Finally, there is a great Vietnamese restaurant here in Rio Rancho that is not only great but also very reasonably priced, compared to other two establishments here in Rio Rancho. We visited the restaurant just last week for the first time. 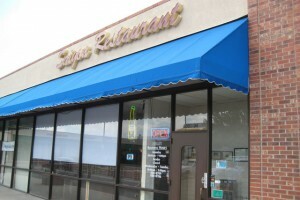 Now we don’t have to drive all the way to Albuquerque’s Central and Louisiana area to get some good pho’s or other favorite Vietnamese food. 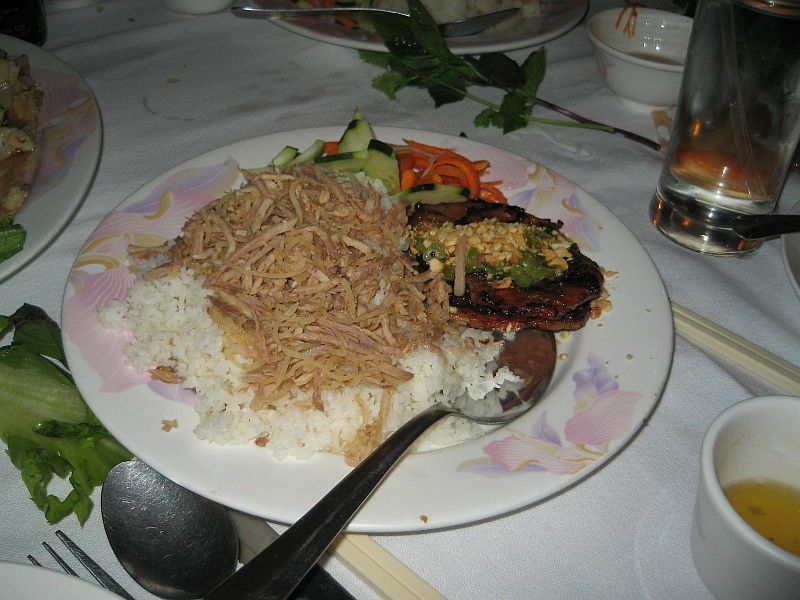 Saigon 2’s pork is great.